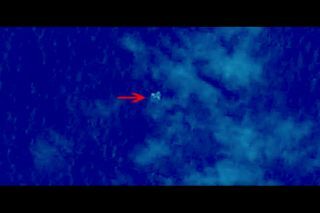 A Chinese satellite imaged three objects floating in the South China Sea on March 9, 2014, but officials now confirm the objects were not parts of Malaysian Airlines Flight 370, which went missing on March 7. Image uploaded March 13, 2014. Three objects spotted floating in the waters northeast of Kuala Lumpur by a Chinese satellite were not parts of the missing Malaysian Airlines flight that disappeared Friday (March 7), according to press reports. Crews searching for Malaysian Airlines Flight 370 didn't find any wreckage in the area imaged by the Chinese satellite, the BBC reports. The satellite images of the South China Sea, taken on March 9, surfaced on Wednesday (March 12). NASA officials are using data collected by NASA satellites to hunt for the missing jetliner as well. The space agency is looking into archived satellite information that might help them find signs of the missing plane. NASA is currently using space-based instruments like the Earth-Observing-1 satellite and ISERV camera on the International Space Station to get new images of possible crash sites, NASA spokesman Allard Beutel told Space.com via email Wednesday.